Crafty escapism: Hat done & magazine purchase! 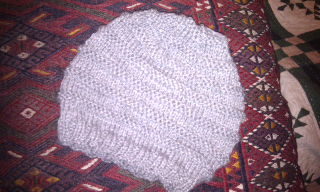 Finished the hat. Worked out well, better than grey hat #2 I reckon. Wondering how on earth I managed to substitute needle size yarn thickness recalculate the pattern and get the size just right! Total fluke. Bought my first knitting magazine ever today: Knit simple. Major determining factor in choosing this one (apart from being in stock in the newsagent) is sold by Bristol yarn shop Get Knitted. Very excited by this magazine! Feel a bigger than sock/hat/mochimichi animal project coming on......!